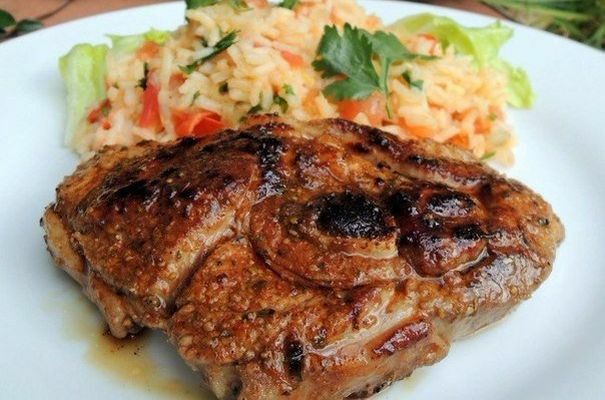 The flesh of veal (beef) – 0,5 kg. Ginger root – the root is 3-4 cm. Black pepper peas – 6 PCs. Salt, ground black pepper, to taste. Step 1 wash the Meat and dry it. Cut in half lengthwise, but not completely. Open it up like a book and have a little beat to make it smooth thickness. RUB on all sides with salt and pepper. Step 2 Prunes wash, dry and cut into pieces. Ginger root peel and grate on a fine grater. Mix with prunes. 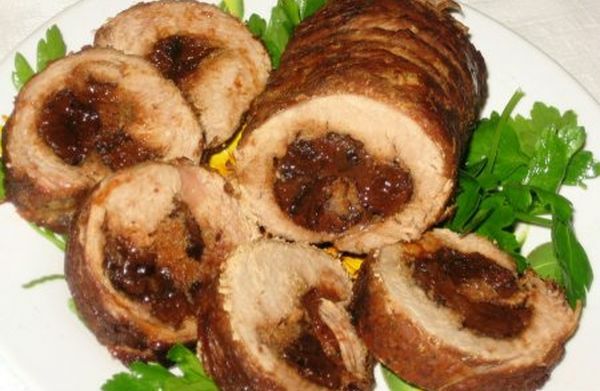 Step 3 Put the prunes with ginger on top of a layer of meat and roll the meat in the loaf. Tie a thick roll of cooking string. Step 4 On a heated oil fry the rolls on all sides. Step 5 Peel and slice onion rings. To put it on the bottom of the pot. Add the Bay leaf and peppers. From top to put the roll. The pan in which the meat was browned rinse 150ml of hot water and pour it into the pot. Cover and simmer on low heat for 2 hours. Turn the meat periodically to water or juice. If the liquid in the pot a little – add a little water. Step 6 Ready the meat to cool, remove the thread and cut into slices.